One of my weekend chores was to go through stacks of old magazines- a fun endeavor, actually, as I oftentimes find articles that had completely slipped my mind. Case in point, this Albert Hadley project that was featured in the March/April 2001 issue of Veranda. This particular project was very personal to Hadley for a few reasons. First, the client was his sister, Betty Ann, who at the time was embarking on a move from the Hadley homestead in Nashville. 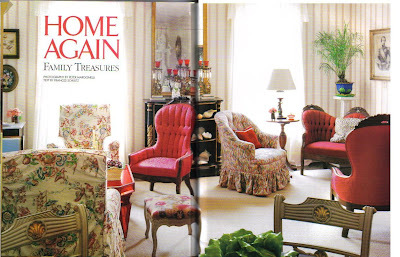 Along with Betty Ann came Hadley family heirlooms, including several pieces of Victorian era furniture. While other designers may have seen these family pieces as an albatross, Mr. Hadley thought quite the opposite. To him, these family relics were old friends, and really, who wants to throw out a friend? Even though I'm still not a fan of Victoriana, in the hands of Mr. Hadley the pieces actually become rather palatable. What strikes me about this home is the fact that it doesn't look too decorated, forced, and stripped of any life, an affliction that seems to affect more and more homes today. What's wrong with hanging on to a few friends from the past, even if it means trotting them out for show in the living room or parlor? Just a little food for thought... in case you didn't have enough of it over the holiday! The c. 1940 French red-mirrored glass table formerly resided in Hadley's Manhattan apartment. 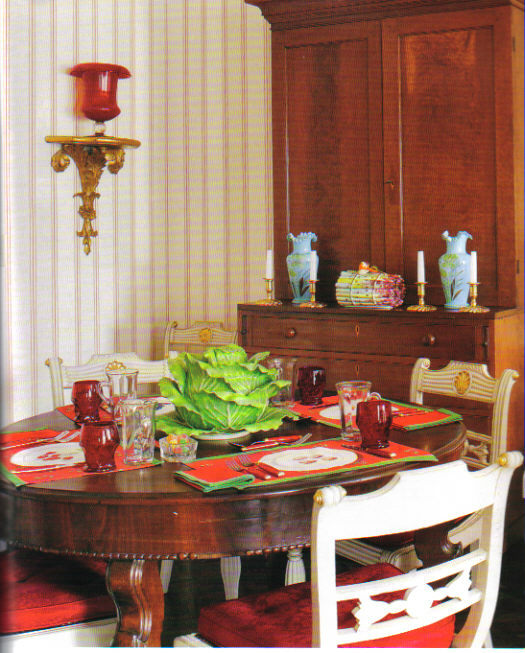 Years ago, he mentioned to his mother that he was thinking of selling the table; Mrs. Hadley told him to please send it to her...and now it resides in Betty Ann's home. 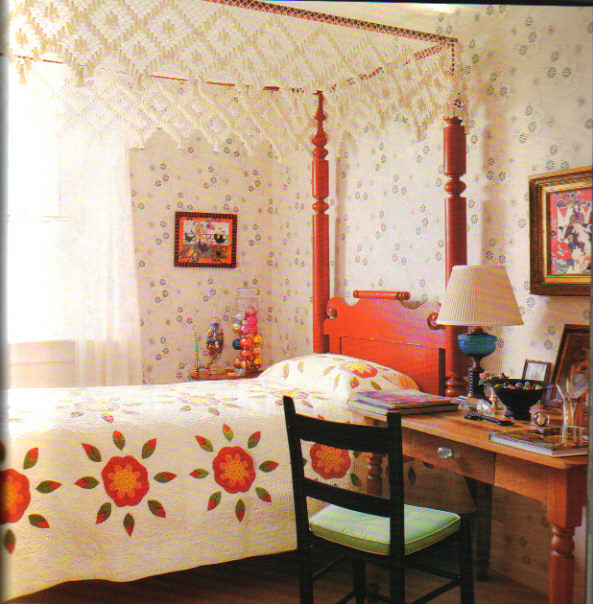 The wallpaper is a custom design by Hadley. Butler's press is 19th c. American. 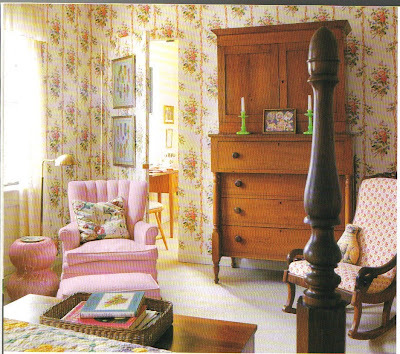 The tureen appears to be Dodie Thayer, and the asparagus stalk tureen is also 20th c.
The Victorian bed, rocking chair, and cupboard-on-chest are all family heirlooms. The framed paper dolls, hung on the jib door, were drawn by Hadley for his sister when they were children. The decoupage pictures in the guest bedroom are by Susan Crater, granddaughter of Sister Parish and author of the recent "Sister Parish Design". The wallpaper was custom printed from the archives of Albert Hadley Inc.
At the time it made me rethink some of my grandmother's things -- she had chairs identical to the Victorian ones shown here. The warm cheerful red used by Hadley seems to make all the difference. Love old issues of magazines. Great inspiration. What a sweet and cheery house. it all looks so fresh! Agreeing with Courtney that the red is so charming. The paper dolls almost make me teary - that is incredibly sweet. How does Albert Hadley do it? talent. I find myself in awe, going over the details and analyzing the ingredients, and finally coming up with the realization that the most elusive thing in the world is Style. Which puts Mr Hadley in a class by himself. It's sweet and charming without being too sentimental. He manages to take the old and make it completely fresh but all in a very natural kind of way. I love reading anything about Hadley. When you find pictures in an old magazine how do you make the pictures come out so clearly? Do you have a place on the internet to download from or do you take the pictures of the magazine with your camera? Nancy, I scan the photos into my computer and then upload to my blog. It takes a lot of time, but the end result is worth it! It's a very pretty living room, very pretty indeed. But very upright, no? I can't imagine anyone slouching! Albert Hadley is a genius. 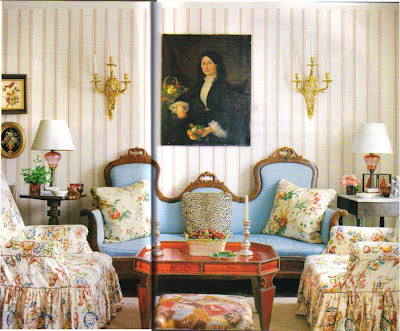 I love how his rooms feel comfortable, gracious, timeless and collected. He takes the family goods and makes great! Love seeing the story behind the story! It's so interesting to see what designers do with their personal history! Not at all uptight for a southern woman of her class. That kind of woman never slouches; nor do her guests. EVER. I think it's a sprightly house and probably made Betty Ann Hadley feel 20 years younger - an enviable gift. A lot of writing about Albert Hadley borders on hagiography; this project warrants praise. I remember this like it was yesterday! thanks for revisiting it. I love Victoriana but stress out over how to blend them into a room so it doesn't look too......? Interesting to see Victorian parlour suite furniture updated and integrated in a contemporary setting. Usually we associate this type of furniture to hot, stuffy old lady houses or musky mid-range antique stores. Hadley is just brilliant. Elaine Griffin and "Design Rules"